Correctional officers in Connecticut work in a variety of local, federal, and state incarceration and administration facilities. While a number of these facilities are publicly owned, increasingly there is a trend toward hiring third-party contractors to manage all aspects of the facility. Facilities have a range of incarceration options available - some, like the Bridgeport Correctional Center contain a minimum-security unit for inmates who have clearance for outside jobs and community support programs, as well as a maximum security sector. Others, like the Garner Correctional Institution specialize in programming, support, and incarceration for an inmate population with mental health concerns. 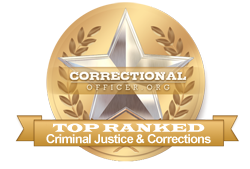 Regardless, Connecticut's state Department of Corrections maintains a safe, professional atmosphere for staff, inmates and surrounding communities at all times. BLS.gov forecasts that staffing needs over the next 10 years are poised to grow at a steady rate - in Connecticut this means that there will be approximately 250 new positions created for frontline correctional officers, as well as replacement staffing needs for retirement and attrition, and advancements to supervisory or specialty roles. Read on to discover more information about opportunities in corrections below. University of New Haven ranks first in our rankings with 393 students completing programs in law enforcement administration, criminal justice, and security and loss prevention services out of a total three thousand graduates in the 2012-2013 school year. Mitchell College ranks 2nd in our latest rankings with 27 students graduating from programs in criminal justice out of a total 372 students from the 2012-2013 school year. Western Connecticut State University ranks 3rd in our latest rankings with 125 students graduating from programs in criminal justice and law enforcement administration out of a total 2,344 graduates from the 2012-2013 school year. Manchester Community College ranks 4th in our latest rankings with seventy-four students completing programs in corrections and criminal justice out of a total 1,852 graduates from the 2012-2013 school year. Housatonic Community College ranks 5th in our latest rankings with forty-eight students completing programs in corrections and criminal justice out of a total 1,266 graduates. Middlesex Community College ranks 6th in our latest rankings with 23 students completing programs in criminal justice out of a total 620 graduates. Norwalk Community College ranks 7th in our rankings with thirty-three students graduating from programs in criminal justice out of a total 1,346 graduates in the 2012-2013 school year. Albertus Magnus College ranks 8th in our rankings with 26 students completing programs in criminal justice out of a total a thousand graduates in the 2012-2013 school year. Northwestern Connecticut Community College ranks ninth in our latest rankings with nine students graduating from programs in criminal justice out of a total 404 students in the 2012-2013 school year. Tunxis Community College ranks 10th in our latest rankings with 25 students completing programs in criminal justice out of a total a thousand students from the 2012-2013 school year. Should all assessments show that a candidate is a good fit for a job wit h the Connecticut Department of Corrections, he or she is placed as need dictates, or into a hiring pool. Newly hired staff for hazardous duty positions are required to attend and pass a 10-week paid training course that focuses on the development of practical skills for their new role. One of the ways that the state of Connecticut strives to serve and support correctional officers is through strong job growth and competitive salaries. Currently, the median income for front-line correctional officers throughout the state is higher at $53,000 than that of the national median income of $39,800. According to the occupational profile for the state of Connecticut found at http://www.careerinfonet.org/occ_rep.asp?next=occ_rep&Level=&optstatus=011000000&jobfam=33&id=1&nodeid=2&soccode=333012&menuMode=&stfips=09&x=52&y=2 published by CareerInfoNet.org, state and national trends predict a 8% and 5% increase in correctional officer jobs by 2022 respectively.